An important aim of this paper is to increase the level of rigor that we use to understand the role of the state as an institution determining the economic performance of other institutions. More specifically, we seek to increase our understanding of the role of the state in determining the economic performance of two distinct type of markets: “spontaneous” markets and “socially contrived” ones. Thus, in the next section we identify the main characteristics of these two types of markets. We then discuss in detail the role of the state in these two types of markets by identifying the specific services that the state provides and how they improve the functioning of the two types of markets. Sometimes these services have been referred to as market augmenting services in the new institutional economics literature. In general they are considered to be public goods. What has been missing from the literature is a systematic focus on the role of these services not as general public goods but as specific public inputs that affect the operation and economic performance of the two types of markets. Frequently, they do so in a differential way. In the second section, we characterize these public inputs in detail, identify four of them explicitly, discuss how two of them have the nature of “pure” public inputs and their production may be subject to threshold effects. Furthermore, we discuss how the effects of all four on the operation of markets may be associated with the existence of increasing returns in the production of some of them or in their effects generating increasing returns in the markets they affect. We discuss in the third section some empirical evidence on the importance of these public inputs for the economic performance of the two types of markets. Finally a subsidiary aim of this paper, which is accomplished in the fourth section, is to draw some implications of this improved characterization of the role of the state in determining economic performance for the possible paths of evolution of the Cuban economy. We will divide markets into two general types that will be labeled “spontaneous” and “socially contrived,” following Olson’s (2000) terminology. Others, for example North (1990), have used the labels “traditional” and “modern” to make a similar point. What is important is not the label that one uses but the characteristics that one associates with each type of market. In the case of “spontaneous” markets, one characteristic that they frequently share with traditional ones is that transactions are self-enforcing. One can say that this characteristic is sufficient, but not necessary, for a market to be classified as spontaneous. Transactions are self-enforcing when both parties to an exchange have a variety of incentives to fulfill the terms of the exchange. Three features of markets are identified (by North) as making transactions self-enforcing: (1) the transactions are repeated; (2) the number of different persons participating in the market is small; and (3) both parties to the exchange have abundant information on each other. A recent analysis of clusters, Thompson (2005), uses the modern IO literature on contracting to show why relational contracting in developing countries is selfenforcing. One can relate easily the previous three features to the ones emphasized by Thompson: (1) repeated interactions increases the value of the relationship; (2) the small number of participants allows trust to build in the relationship, especially if friends and relatives are involved; and (3) information on both sides allows for community enforcement of contracts as an informal mechanism. Our first point is that self-enforcing transactions are a characteristic of many “spontaneous” markets and in these markets we will find the three features that lead these transactions to be self-enforcing. Whether these features are expressed in terms of the new institutional economics or modern IO contracting theory is to a large extent a question of semantics. In earlier work Clague, Keefer, Knack, and Olson (1999) characterize “spontaneous markets” as “…selfenforcing. These markets are common, either because many exchanges simply meet the conditions for self-enforcement or because they are so lucrative that the absence of self-enforcement makes even risky exchanges worthwhile.” Some of these markets exist even when the state tries to suppress them. Thus, there is a second defining characteristic of “spontaneous” markets that is implied in the quote: lucrative, which is a somewhat narrow term. A more appropriate general term would be the size of the gains from exchange for both parties. If sufficiently large in terms of the preferences of the participants, it can lead to the existence of “spontaneous” markets even when transactions are not self-enforcing. Often illegal markets have this feature. Olson (2000) sometimes refers to “spontaneous” markets as irrepressible. Not surprisingly, given the previous discussion, a necessary characteristic of “socially contrived” markets is that transactions are not self-enforcing, i.e., the participants in an exchange have strong incentives not to fulfill the terms of the exchange. Sometimes these markets are identified as modern, North (1990), and again three features that are complements to the ones associated with traditional markets are used to generate the incentives for non-enforcement of the terms of the exchange: (1) transactions are unique or not repeated often; (2) the number of different persons participating in the exchange is large; and (3) the participants have little or no information on the persons participating on either side of the exchange. In Clague, Keefer, Knack, and Olson’s (1999) view, these markets are not self-enforcing because the benefits to one party to the exchange are separated temporally or spatially and/or by a state of nature from the benefits to the other party and this, by itself, creates an incentive for non-fulfillment of the terms of the exchange by one of the parties. These markets are characterized by non-simultaneous transactions. In these markets, third party enforcement of contracts becomes critical for their existence or operation at a high level. Incidentally, one can credibly argue that Hernando de Soto’s (2000) book, The Mystery of Capital, is an argument or a plea to convert the informal assets of the poor in developing countries into formal assets through the development of these “socially contrived” markets for property held by the poor. What is the relative importance of these two types of markets in an economy? One pass at the answer comes from Clague, Keefer, Knack, and Olson (1999, p. 397) who state: “To obtain the broadest reasonable measure of the industries that are especially dependent on contract enforcement, we took the aggregate of the finance, insurance, real estate, and business services sectors as a percentage of GDP from the United Nations Accounts data.” From the U.S. Statistical Abstract these figures in recent years would be : 1990, 21%; 1995, 22%; 2000, 25%.2 An alternative pass comes from Wallis and North (1986) who identify transaction sectors and non-transaction sectors. The former includes finance real estate and insurance as well as retail and wholesale trade. The share of GDP of their “transactions sector” for the U.S. yields: 1990, 33%; 1995, 34%; 2000, 35%. In sum, conservative estimates suggest that sectors of the economy where third party enforcement is important took up between a fifth and a third of GDP in 1990 and that this proportion grew to between a quarter and 35% during the last decade of the twentieth century. Wallis and North (1986) also argue that many transactions in other sectors fall into this category but can not be directly identified as transaction activities that are separate from the transformation ones. Thus, these numbers are an underestimate of the resources devoted to this type of market because there are activities in other sectors of the private economy where the same considerations with respect to third party enforcement would apply, but it is not easy to separate by sector if the activities are taking place in “spontaneous” markets or in “socially contrived” markets. For instance, most modern labor markets are “socially contrived,” regardless of the sector in which the firm operates. In addition, the government sector uses up resources to create the possibilities for markets of both types to exist, but especially so for the “socially contrived” ones. The ratio of the U.S. Government’s contribution to GDP during this period is: 1990, 14%; 1995, 13%; 2000, 12%.3 Of course, not all these government expenditures are incurred to provide contract enforcement services but “socially contrived” markets also need other public inputs frequently provided by governments. We now turn to consider what these inputs may be. Both types of markets require the state or an alternative institution to provide several services to exist or operate at a high level. 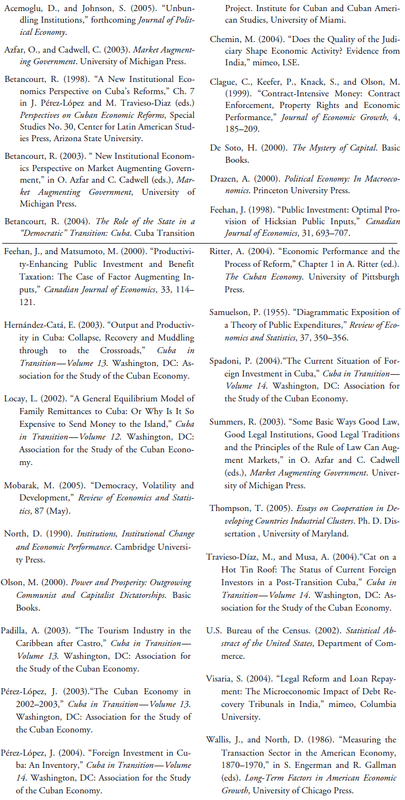 For instance, in evaluating Cuba’s reforms Betancourt (1998) follows an early version (1994) of Clague, Keefer, Knack, and Olson by stressing two services that apply to both types of markets and one that applies to “socially contrived” markets. The two that apply to both types of markets are: “law and order,” in the sense of absence of a state of anarchy where people are dispossessed of the gains from exchange arbitrarily on a frequent basis;4 and a reliable medium of exchange, in the sense of a currency that allows transactions to take place without the need for barter exchange.5 The one that applies only or mainly to “socially contrived” markets is the existence of third party enforcement of contracts as normally provided by an impartial judiciary. One of the arguments made by Betancourt (1998) is that alternative institutional mechanisms, for example corruption, arise to fill the void created by the absence of the government providing impartial third party enforcement. This factor and the predominance of “spontaneous” markets in agricultural societies may be one basis for the explanation of shortrun economic success in Vietnam and China despite the absence of impartial third party enforcement by the judiciary. This alternative may not be as effective in promoting growth over the long-term as an impartial judiciary. Because it generates more uncertainty, especially when there is competition among the suppliers of corruption services. In a book published posthumously Olson (2000) argues that the above services capture the active role of the state, but that in addition for “socially contrived” markets to thrive there is a passive role that involves a commitment not to predate or to have the power of the state used for predation by small groups and that this is demonstrated through the protection of individual rights, of persons and firms, that are broad and secure. Betancourt (2004) picks up on this theme and characterizes this passive role of the state as a commitment to abide by the rule of law.6 More generally, the existence of this commitment also facilitates the operation of “spontaneous” markets at a higher level, but its absence has a much smaller effect on “spontaneous” markets than on “socially contrived” ones. Services provided by governments in support of markets have been recently referred to as market augmenting government at a conference in honor of Mancur Olson, Azfar and Cadwell (2003). Clearly the three identified above as well as the rule of law would qualify as deserving of the name. This name, however, should not obscure the reality that these services can and should be thought of as public goods. Furthermore, Betancourt (2003) points out that these services are public goods that increase market output indirectly by increasing the gains from exchange through a reduction of transaction costs and are likely subject to threshold effects and increasing returns. There is a vast and substantial literature on public goods, but most of the literature approaches the subject by viewing public goods from the consumption side, e.g., Drazen (2000). The two defining characteristics of a public good in this setting are non-rivalry, or the extent to which consumption by one agent does not affect consumption by another agent, and non-excludability, or the extent to which barriers to entry into consumption are feasible in the provision of the good. The former determines whether the public good is a pure public good (no effect on other consumers) or an impure one. The latter determines whether or not it is feasible to provide the public good as a club good (if barriers to entry into consumption are possible). At least two of the four public goods identified previously qualify as pure public goods or as close to pure public goods as one can come.7 For, it is difficult if not impossible to conceive of some core elements of the rule of law or of a medium of exchange where congestion effects are relevant, at least with homogeneous consumers. On the other hand, it is easy to think of situations where basic aspects of law and order available to some maybe less than what is available to others. For example when crime is at a high level in a given area, law enforcement services are likely to vary across even homogeneous consumers. Because location itself will be a source of heterogeneity, even if everything else were indeed equal. Similarly, it is easy to conceive of situations where contract enforcement services available to some differ from what is made available to others. Indeed, recently Chemin (2004) uses differences in the pendency rate across Indian state courts to measure the impact of contract enforcement on breaches of contract and relationship specific investments for a sample of Indian non-agricultural informal firms. Similarly, Visaria (2004) uses the differential introduction of debt recovery tribunals across states in India to evaluate the impact of differential contract enforcement due to judicial quality on loan repayments. From the exclusion perspective it is difficult to exclude individuals from access to a medium of exchange or to the rule of law while these two public goods continue to perform their role as market augmenting services. For instance, even as opressive a regime as the Castro government did not try to exclude some of its citizens from the use of the dollar as a medium of exchange when it made the dollar legal tender in 1993. Similarly, it is incongruent with the rule of law to have it apply to some individuals and not to others as the historical disappearance of slavery as a recognized legal institution makes evident. It is much easier to conceive of mechanisms where law and order and contract enforcement services can be made available to some and not to other members of society by introducing barriers to their consumption. For instance, one can observe communities that provide their own security services within their gates in cities of both developed and developing countries. Similarly, the need to pay for lawyers to access some contract enforcement services suggests that exclusion is possible in the provision of this service. In all four cases, however, one of the most relevant features of these public goods or services is that they are inputs into the operations of markets. They are inputs in the sense that higher levels of these services allow markets to operate at a higher level of transactions. It is this role of public inputs that has been neglected in the literature on institutions. While the public finance literature has extended the analysis of public goods to public inputs, it has done so primarily under the assumption of economy wide diminishing returns, referred to as firm augmenting public inputs, or economy wide increasing returns consistent with perfect competition, referred to as factor augmenting public inputs. This terminology is developed by Feehan and Matsumoto (2000). Furthermore, the standard assumption in this literature is that the production function for the public input itself is a neoclassical one subject to constant returns to scale, for example Feehan (1998). While these assumptions may be eminently sensible when applied to public inputs such as infrastructure, it is not clear that they are equally sensible when applied to two of the market-augmenting services we have identified here. Both the production of the rule of law and of a reliable medium of exchange seem subject to thresholds in that either you have them or you do not have them at a certain level. Changes in the levels of these two market-augmenting services seem to be quite discrete. It also seems easier for the state to “produce” a reliable medium of exchange through the introduction of fiat money, for example, than to “create” a rule of law through credible commitments not to engage in predatory behavior. In the former case declaring a medium of exchange legal tender seems usually sufficient to generate a minimum level of this service. By contrast, declaring respect for the rule of law by itself is unlikely to be a credible commitment in many if not most cases. With respect to the rule of law it is less clear how one accomplishes the task of creating or increasing the service than with respect to a reliable medium of exchange. Furthermore, increasing returns seem to be potentially important in the following sense. Suppose one were to double the resources devoted to the creation of the rule of law. This could be done, for example, in the form of protecting human rights such as freedom of assembly and speech by devoting resources to encourage citizen participation in these activities. This doubling may take us from a very low or minimal level of the rule of law to a very high one (more than double so to speak) if successful or to not much change if unsuccessful. To my knowledge, no one has tried to model explicitly the production of these four public inputs and/or their effects on the two types of markets that we have been discussing. Attempts to do so would need to pay attention to some of the distinctions emphasized here. Taking into account thresholds and increasing returns in the production of the rule of law as well as the potential for increasing returns on its impact on the operation of “socially contrived” markets would seem to be the highest priority, at least judging by some of the results available in the empirical literature discussed below. Do we know anything about the impact of these public inputs or market-augmenting services on economic outcomes? There have been some attempts at measurement and at exploring their impacts on per capita income and its growth, which we now review. There are a number of conceptual and/or measurement issues that arise in connection with these market- augmenting services or public inputs. For instance, we just argued that the rule of law is a multidimensional concept and that one of its elements is produced by the same mechanism as impartial third party contract enforcement. When we come to measurement, these subtle distinctions can be difficult to capture. Clague, Keefer, Knack, and Olson (1999) introduce contract intensive money (CIM) as an “… objective measure of the enforceability of contracts and the security of property rights.” This measure is simply the ratio of demand deposits (DD) plus time deposits (TD) to M2 = DD + TD + C, where C is currency. The fundamental idea is that CIM is a reflection of the type of governance that improves economic performance. The rule of law (as the main determinant of the security of property rights) and impartial third party enforcement by governments (as the main determinants of the enforceability of contracts) are the more fundamental causes of economic performance that this variable is capturing. In a more recent paper Acemoglu and Johnson (2003) try to unbundle institutions by separating property rights institutions and contracting institutions. By property rights institutions they mean “…institutions constraining government and elite expropriation …”; by contracting institutions they mean “… institutions supporting private contracts …”. In principle these two correspond, respectively, to what we have called the rule of law and third party enforcement. They use two measures to proxy for the rule of law: Political Risk Services assessment of protection against government expropriation in a country and Polity IV’s constraint on the executive measure. The extent of third party enforcement is measured by the number of formal legal procedures necessary to resolve a simple case, for example collecting on a bounced check or evicting a non-paying tenant. This is derived from the legal formalism database compiled by Djankov, La Porta, Lopez-de-Silanes, and Shleifer. Presumably the higher the costs of enforcing private contracts by government the lower the effective level of third party enforcement. Acemoglu and Johnson (2003) find that both property rights measures have a strong and statistically significant effect in explaining the log of GDP/POP in 1995 PPP $. This is the case for both OLS regressions and 2SLS regressions using log of settler mortality or log of population density around 1500 as an instrument. The measures of legal formalism have no effects on GDP/POP when using constraints on the executive and the wrong sign when using average protection against risk of expropriation as a measure of the rule of law. These results are taken from Table 4 in their paper. Acemoglu and Johnson (2003) argue that this impact on per capita income in their cross-country setting captures the impact on the long run rate of growth. Clague, Keefer , Knack, and Olson (1999) find that CIM, which captures both dimensions of institutions (namely the rule of law and third party enforcement), is an important and robust explanatory variable in explaining cross-country growth in GDP/POP between 1969 and 1990, except when the investment to GDP ratio is also included. These results are from their Table 4. Clague, Keefer, Knack, and Olson (1999) analyze the effect of CIM on the investment to GDP ratio. They find that CIM is an important and robust explanatory variable in explaining the investment to GDP ratio (Table 3). Hence, their overall conclusion is that the rule of law and third party enforcement are important in explaining growth through their effect on investment, not necessarily through their direct effect on growth. Acemoglou and Johnson (2003) also look at the effect of rule of law and third party enforcement on the investment to GDP ratio and they find a strong positive and robust effect for their measures of the rule of law and a statistically insignificant effect for their measures of third party enforcement (Table 5). Given their results for “medium term growth” reported above, the interpretation that both CIM and their measures are capturing mainly rule of law effects and that these work through investment seems the appropriate conjecture at this stage of our knowledge. Given the recent paper by Mobarak (2005) about the effect of democracy on growth, it seems reasonable to suspect that the rule of law in particular may have a similar effect. That is, Mobarak finds that volatility reduces growth and this effect is robust. On the other hand, democracy has no direct effect on growth. Yet, it is a very robust determinant (with a negative sign) of the volatility of growth. Given the results on “medium term growth” reported earlier and that rule of law would be one of the main determinants of democracy, one may expect similar results if the extent of the rule of law was used as a proxy for democracy. In order to draw implications for the future, it is desirable to provide a synthesis of where we are at present. There is a fair amount of agreement on the characterization of Cuba’s economic policies between 1989 and 2004 but less agreement on the evaluation of the economic performance associated with these policies, especially in the most recent period. The policies can be classified into four mainly chronological periods. First, there was a period of belt tightening and inaction (1989–1992) in response to the end of Soviet subsidies. Associated with this period was a substantial fall in GDP and its rate of growth, which was negative in all four years and with rates of decline over 10% in the last two years of the period (e.g., Ritter, 2004, Table 1.2). This period was followed by a short one (1993– 1996) of substantial economic reforms oriented toward the development of a market economy. These reforms included: dollarization; allowing state farms to become cooperatives, farmers’ markets to operate, and certain forms of self-employment; legalizing foreign investment in various sectors and promotion of tourism; macroeconomic stabilization and a switch to western national income accounting methods by the Central Bank. Growth of GDP stabilized and became positive by the end of the period (e.g., Ritter, 2004, Table 1.2). A third period (1997–2002) can be characterized as treading water because some of the earlier reforms were slowed down (for example, imposition of restrictions on and excessive taxation of the self-employed) and some “reformers” were purged from influential positions while new reforms (for example managerial improvements in state enterprises) were supported with vigor at least on paper. The rate of growth of GDP remained positive every year but fluctuated considerably and was fairly low the last two years of the period. For instance, Ritter’s Table 1.2 ends with 2.7% for 2001 and Pérez-López (2003) gives a figure of 1.1% for 2002, which is consistent with Ritter’s discussion of what he expected for 2002 due to the world economic slow down and the effect of September 11 on tourism. By the end of this third period Cuba’s economy had changed dramatically from where it was in 1989. Among the most dramatic changes is the decline of sugar in terms of its contribution to output. In the first period (1989 to 1992) sugar output fluctuated between 7.2 and 8.4 million tons of annual production; in the third period sugar output fluctuated between 3.5 and 4.3 million tons of annual production. Similarly, there was a substantial increase in the production of oil and natural gas during this period. For instance, from well under a million tons of oil in the first period (1989–1992) production rose to average over 2 million in the period 1996–2002 (Pérez-López, 2003, Table 2). Yet, oil imports still account for 55–60% of Cuba’s oil consumption. This makes Cuba’s merchandise imports from Venezuela, which went from 451.5 million pesos in 1999 to 951.5 pesos in 2001 and are mainly in the form of oil, all the more critical. Among other significant changes during this period two are worth noting. First, there is the increasing importance of tourism in Cuba. For instance, the number of tourists has been growing at an annual rate of 15% since 1985 (Padilla, 2003). Tourism is now more important than sugar in terms of foreign exchange earnings. Second, there is the equally rapid growth of “remittances.” The latter grew from $263 million in 1993 (Locay, 2002) to $1.1 billion in 2002 (Pérez-López, 2003). Thus, they have become the most significant single item in terms of net hard currency earnings. Incidentally, there is a substantial difference of opinion on whether these numbers actually reflect remittances in the usual sense, see Locay (2002) and the references therein for a discussion. In evaluating economic performance during these three periods, Ritter (2004) concludes that petroleum extraction and food production due to the establishment of agricultural (farmers’) markets have been most successful. He also goes on to argue that Cuba is in a pre-transition stage, similar to Hungary and Poland in the 1980s, and that economic policy and the institutional structure “…will likely remain paralyzed…” until Castro dies. Hernández-Catá (2003) in evaluating economic performance over these three periods concludes that the reforms of the second period have exhausted their ability to propel the economy in the third period. He forecasts little growth opportunities in the absence of further reforms. His analysis is based on a decomposition of GDP by sectors of the economy, which allows him to show that improvements due to total factor productivity increases from the second period reforms rather than investment were the basis for the growth in the third period. Indeed, figures in Pérez-López (2003) show that gross capital formation over GDP decreased from 16.2% in 1997 to 12% in 2002. This finding suggests that one of the critical economic problems facing the Cuban economy, if not the most critical one, is raising its level of investment to GDP. The market-augmenting services that we are emphasizing are important for long-run growth precisely because of their role in allowing the financial markets that make these investments possible operate efficiently and at a high level. What can we say about these markets in Cuba? Hernánez-Catá’s research is useful in addressing this question. His decomposition of GDP provides some information on two important transactions sectors: commerce and finance. First, the real GDP contribution of commerce and finance goes down percentage wise from 1989, when it is 25% and 8%, respectively, to 2000, when it becomes 21% and 4%, respectively. This period includes data from two different sources and part of the decline may be due to the change in source. On the other hand, state employment data for these two sectors, which has the same problem, shows an increase from 11% to 12% [1% to 2%] of total state employment during this period for commerce [finance]. While these figures are poor measures of the operations of these markets, they are dramatic enough to suggest significant declines in the efficiency of these markets (output goes down while one of the inputs is going up) prior to the current period to which we now turn. The most recent period (2003–?) can be characterized in terms of economic policies as a retreat to socialism. It is marked by attacks against independent journalists, economists, and other dissidents that resulted in the imprisonment of 75 of them early in 2003. The subsequent condemnation by the international community led to strained commercial relations with Europe. This has been followed by proclamations in favor of central planning, limits on state enterprises independent handling of foreign exchange, and in the Fall of 2004 to a de-dollarization of the economy, making transactions in dollars illegal. The performance of the economy during this period has become the subject of controversy. Cuban authorities claim a rate of growth of GDP for 2004, for example, of 5% but ECLA estimates suggest 3%. The sugar harvest is lower than previous low results. Persistent anecdotal evidence on electricity blackouts unrelated to industrial production and similar reports on available portions of the monthly rations suggest a worsening economy. The increasingly close political association with Venezuela is also consistent with an increased need for their oil. To conclude this discussion of where the economy is at present, it is useful to note in more detail the role of foreign investment. It was not until 1992 that the Cuban Constitution was amended so that foreign investors could own property. Furthermore, the basic law governing foreign investment (Law No.77) was not passed until 1995. Travieso-Diaz and Musa (2004) note that it explicitly allows for three different forms: joint ventures, cooperative production contracts, and management contracts. Only the first form leads to the creation of a new legal entity. Not surprisingly, there was little FDI of any type prior to 1995 and all three types have grown considerably in the 1996–2002 period. Pérez-López (2004) provides an excellent account of the inventory of the three types of projects. He differentiates between total estimates derived as stocks and those derived from flows. The former usually generate figures of between $5 and $6 billion, because they include announced intentions rather than actual investments. The latter usually generate figures between $1.7 and $2 billion for the same period, because they are derived from balance of payments figures that include only actual investments. One of the reasons foreign investment attracts so much attention in the Cuban case is that it is associated with the more economically successful sectors of the last 15 years: for example, tourism, nickel oil, and food processing. Incidentally, Pérez-López (2004) notes that in oil an important form of foreign investment is through risk contracts where the risks associated with exploration are shared between the Cuban government and the exploring oil company. In the most recent period (2003–?) there has been concern that foreign investment is decelerating because, for example, the number of joint ventures declined dramatically, Spadoni (2004). The Cuban government argues that this was the natural end of some of these activities due to unprofitability and that their policy is not to support or encourage unprofitable activities. Spadoni (2004) provides some evidence that foreign investors are unhappy with various aspects of the investment climate, especially their inability to compensate workers directly and to resolve disputes with the local partners. Given the current policy of retreat to socialism, the implications of our analysis of the role of the state in the two types of markets for the evolution of the Cuban economy are relatively clear. While the Cuban state provides the market-augmenting services of a medium of exchange and law and order necessary for both “spontaneous” and “socially contrived” markets to function, it fails to provide the market-augmenting services of commitment to a rule of law and contract enforcement services necessary for “socially contrived” markets to function at any but the lowest possible levels of transactions. This has three major implications for the path of the Cuban economy in the future. First, given the empirical evidence presented above that both of these public inputs affect long-term growth through the level of investment, it is not surprising that capital formation in terms of the ratio of GDI/GDP has been decreasing over the whole period (1989–2004). Nor is one to expect any improvement in the future through the behavior of private domestic investors as long as the current policies of retreat to socialism continue to be pursued. Second, it is also not surprising that transaction sectors such as finance and commerce have declined in terms of their contributions to GDP, despite an increase in public employment in these sectors. Furthermore, little or no improvement in these two sectors is to be expected in the future. Because of the importance of the rule of law for the successful development of markets in these two sectors. Finally, the main possibility for growth in this setting comes through foreign investment possibilities that can overcome the lack of commitment to a rule of law and contract enforcement services. Having the Cuban government as a local partner helps joint ventures as a substitute for contract enforcement services in dealing with other entities in output and input markets, but it provides no protection against expropriation by the local partner in the absence of commitment to the rule of law. Hence, the recent decline in local joint ventures is likely to be associated with the retreat to socialism policies. Joint ventures abroad, on the other hand, have been on the increase since 2003 as a mechanism to promote exports, Spadoni (2004). They are more sensitive, however, to the commitment to the rule of law by governments abroad. The other type of contracts are not sensitive or much less sensitive to the commitment to the rule of law and depend much more on contract enforcement services for which it is easier to find substitutes, for example in the bilateral investment agreements signed by the Cuban government with other countries. These are discussed by Travieso-Díaz and Musa (2004). In sum, the Cuban government seems to have staked the growth possibilities of the Cuban economy on a risky bet that foreign investment, especially in oil exploration, will solve their long-term growth problems and Hugo Chávez will solve the shot-run ones. 1. Earlier versions of this paper were presented at the AEA meetings in Philadelphia and at James Madison University, ODE Spring 2005 seminar series. I thank seminar participants for thought-provoking questions and John Devereux, Nuno Limao, and Rodrigo Soares for insightful comments, while staking claim to remaining errors as my own. 2. Incidentally, the accounts reported in each year’s Abstract change after 2000 due to the change from SIC code to NAICS code for industry classifications. They also change due to the use of GDP rather than GNP as the standard measure of economic accomplishment since 1991. 3. These figures are also from the U.S. Statistical Abstract. 4. Law and order in this sense is interpreted in very basic terms. Hence, it includes the phenomenon, for example, of authoritarian or totalitarian states that often are able to provide high levels of this elementary service. 5. Similarly, medium of exchange is interpreted in very basic terms. Hence, it allows for situations in which inflation destroys mortgage markets, for example, as long as it does not destroy all “socially contrived” markets. 6. Incidentally, a similar distinction is made in an essay on good contract law by Summers (2003). After categorizing specific features required for loans secured by personal property, he goes on to add the need for an underpinning in the basic institutions of society such as respect for the rule of law. 7. Even Samuelson (1955) is viewed as arguing that outside of national defense, maybe, there are no pure public goods, because congestion effects are always possible due to the variability of the benefits from the point of view of consumers. 8. Incidentally, the rule of law is a multidimensional concept and some of its elements require an impartial or independent judiciary for its production, for example the protection of individual rights through a court system. The role of the judiciary in producing these aspects would be quite similar, if not the same, as its role in the production of contract enforcement services. It is in the other dimensions that threshold effects and increasing returns are essential to describe the production process.